Understanding the spin-texture behaviour of boundary modes in ultrathin topological insulator films is critically essential for the design and fabrication of functional nanodevices. Here, by using spin-resolved photoemission spectroscopy with p-polarized light in topological insulator Bi2Se3 thin films, we report tunnelling-dependent evolution of spin configuration in topological insulator thin films across the metal-to-insulator transition. We report a systematic binding energy- and wavevector-dependent spin polarization for the topological surface electrons in the ultrathin gapped-Dirac-cone limit. The polarization decreases significantly with enhanced tunnelling realized systematically in thin insulating films, whereas magnitude of the polarization saturates to the bulk limit faster at larger wavevectors in thicker metallic films. We present a theoretical model that captures this delicate relationship between quantum tunnelling and Fermi surface spin polarization. Our high-resolution spin-based spectroscopic results suggest that the polarization current can be tuned to zero in thin insulating films forming the basis for a future spin-switch nanodevice. 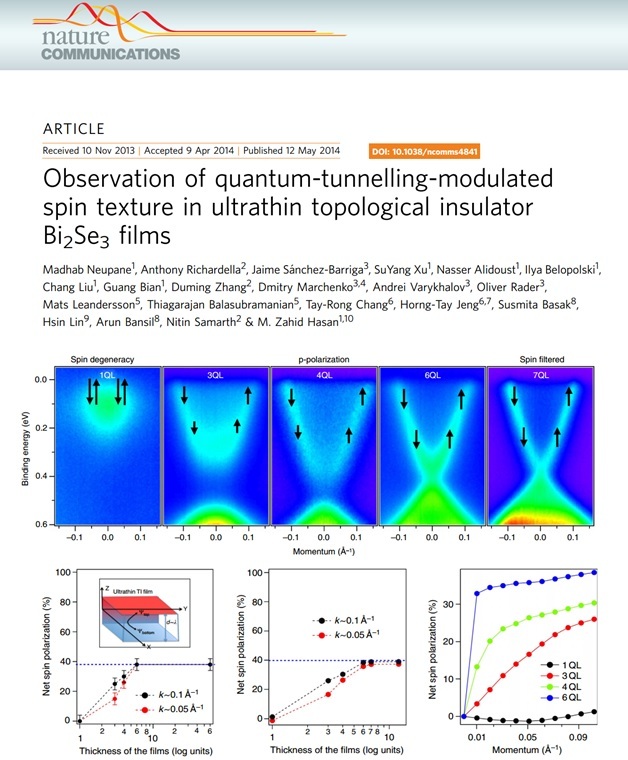 Observation of quantum-tunnelling-modulated spin texture in ultrathin topological insulator Bi2Se3 films. Published in M. Neupane, A. Richardella, J. Sanchez-Barriga, et al., Nature Commun. 5, 3841 (2014).